At the end of all these no hitters, right after the 27th out, there’s the hug between the pitcher and the catcher. The whole team gets in eventually, but there’s always just a little more emotion in that pitcher-catcher connection. 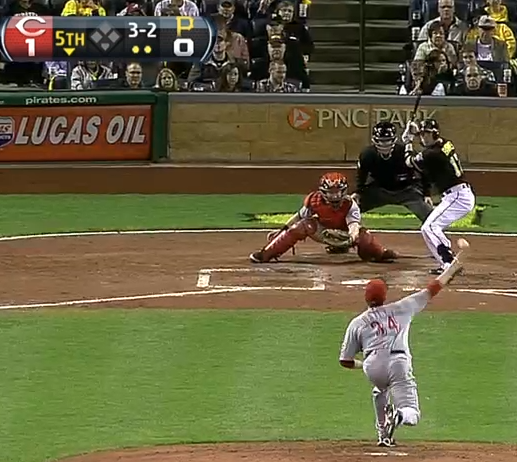 Watching Homer Bailey no-hit the Pirates Friday night, I completely understand why. Against Clint Barmes in the fifth inning, Bailey punished the outside corner. 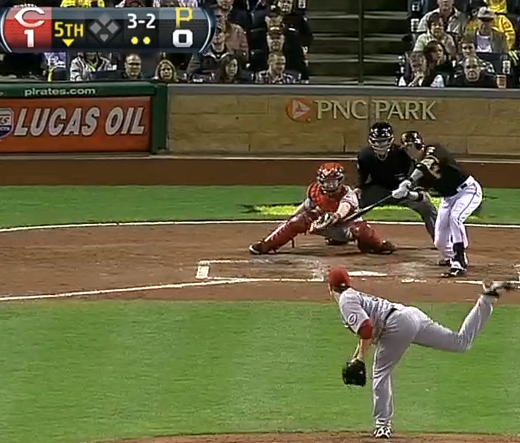 Hanigan exaggerated his targets off the outside corner, and Bailey put the ball right where his backstop asked. Even in a full count, Hanigan shows a target outside the strike zone. Hanigan continually pushes Bailey to get the pitch down, to get the pitch outside. Where does it go? Bailey keeps the pitch down at the knees, he paints the outside corner, and Barmes is punched out looking. Perhaps the pitch was a touch outside, but Hanigan is one of the best pitch-framers in the league today. This was more or less the bread and butter for the first five innings. Bailey threw 18 pitches around the lower-outside corner of the strike zone through the fifth, drawing four swinging strikes, six looking strikes, two fouls and a groundout, getting him into the pitchers’ counts that defined the start. 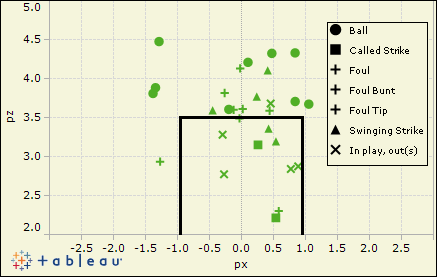 Bailey and Hanigan had one other pitch working particularly well: the high fastball. How often do we see a catcher, with his pitcher ahead in the count, throw up a target so high it seems impossible to draw a strike? These are typically 0-2 or 1-2 waste pitches, where getting the batter to swing is often gravy; the goal is to change the hitter’s eye level and then come back with something low in the strike zone. Some catchers really exaggerate the high target, with some even standing up. With Hanigan, he makes it clear: attack the numbers, close to the strike zone but just above it. Just nine balls against five swinging strikes and five in-play outs. Tremendous success. Bailey and Hanigan only used these pitches four times in the first three innings, but as it became apparent that Pirates hitters like Mercer and Pedro Alvarez were susceptible to them — and that Bailey was hitting his spots with surgical precision — Hanigan put the glove up more and more. The fourth, fifth, seventh, eighth and ninth all saw at least three high-target pitches. This awareness — and the adrenaline that comes with it — was visible in his velocity, a necessary component in sneaking that high fastball by hitters. Bailey was settled in the 89-91 MPH range throughout the first six innings, and he didn’t hit 93 for the first time until the last batter of the sixth frame. By the ninth, Bailey threw just one fastball under 92 MPH. In the ninth, Bailey fully committed to the high fastball. He struck out Brock Holt on four straight. Four of the eight pitches he threw Mike McKenry were directed to the high target, culminating in a popout to left field. Bailey finished with four straight high fastballs to Alex Presley — 12 of 16 in the inning — inducing a pop up to second base to clinch the no-hitter. If ever a start has showcased the possibilities when pitcher and catcher have everything working together, this was it. Hanigan formulated a distinct plan, showed precise targets and used great receiving to get extra strikes for Bailey. And, of course, Bailey perfectly executed the plan, using pinpoint control to keep Pirates hitters from making hard contact. The result of this synergy? Just the Reds’ first no-hitter since 1988. 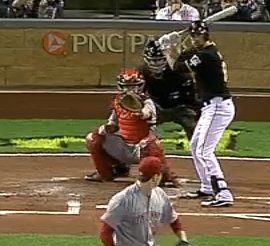 We hoped you liked reading Homer Bailey and Ryan Hanigan No-Hit Pittsburgh by Jack Moore! Those Pirates find a way to rise to the occasion. Can’t wait to see what they have planned for loss #82. To bad they don’t play the Astros again. Then you ‘d know they’d get perfecto’d 3 games in a row.